PJH:4377 wrote: Spin-off #13 was introduced in a 1965 episode of The Virginian in which Trampas and our new heroes locate an overdue train transporting gold, rescue a baby, fight off Yaqui bandits, expose gun-running Mexican soldiers and recover the stolen gold!! The episode proved to be enough of a hit to earn a spin-off series that ran for two seasons (1965-67) on NBC. Fifty-six one hour, color episodes were produced by Universal Television. While never a huge hit, this show had a very loyal following. The spin-off focused on a group of Texas Rangers and combined action and humor, never taking itself too seriously. During the first season there were four main characters (with two more added in the second year). When the Rangers weren’t chasing down outlaws of one sort or another they were getting into and out of all sorts of trouble, usually setting the blood of their boss a boiling! One of the Rangers was an older man who was teased unmercifully by the others about his age—he was in his 40s. The second Ranger was quite the ladies man and the most educated of the characters. The third Ranger was an orphan who had been raised by the Indians. The fourth Ranger was the captain who tried to keep the others in line and often looked the other way when one of their schemes was in progress. Who can answer one or more of these questions? 1.What is the name of this spin-off? 2.What is the name at least one of the actors who starred in this show? Am I right? Was that fast enough? PJH:4407 wrote: Congratulations Cowgirl for guessing that Spin-off #13 is Laredo. Boy, were you fast! First introduced in the Virginian episode, We’ve Lost a Train, Laredo went on to enjoy a two-year run on NBC. The series centered on four Texas Rangers and featured lots of tongue-in-cheek, rowdy humor. It was a western that never took itself too seriously. Reese Bennett (Neville Brand) was the oldest of the Laredo Rangers. A former Union Army office with a checkered past, he joined up to get immunity from a prior life of crime. Reese was constantly being duped into the schemes of the other Rangers and was always being teased about his age (he was in his 40s). Chad Cooper (Peter Brown) was the clever, educated Ranger. He was a ladies’ man, a fast-talker, a schemer, and a tough fighter. Chad was from New Orleans which gave him some expertise in fencing, boxing, literature, and fine manners. Cooper had watched his friends get killed while he fought as a member of the U. S. Border Patrol. His job as a Texas Ranger would allow him to hunt down the Americans who had sold guns across the border. 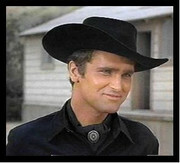 Joe Riley (William Smith) was the street smart Ranger. He was an orphan, raised by Indians, so he was the best tracker, deadly with a knife, and had an eagle-eye for long-distance rifle fire. Riley was a former gunfighter who wanted to become a part of the law, instead of being against it. Captain Parmalee (Philip Carey) tried to keep the ne’er-do-well Rangers in line. He was clever enough to figure out most of their schemes but usually willing to look the other way when things turned out for the best. He had a fondness for good “sippin whiskey” of which he kept a private stock. In several episodes Parmalee ended up with the lady while his Rangers were assigned stable duty! The press release version describes Reese Bennett [Neville Brand] as a former Union Army officer and deputy U.S. marshal with a strong sense of right and wrong. who at 18 brought the killers of his sheriff father to justice. His service in the Union army causes friction with other Rangers who see him as a traitor. Chad Cooper [Peter Brown] is described as a Boston native and graduate of West Point. He joined the Rangers to seek revenge against the Mexican bandits who killed his comrades in the Border Patrol and the American gunrunners who armed them. Joe Riley [William Smith] was to be a cynical, worldly former gunfighter using the Rangers as sanctuary from the law. Captain Parmalee [Philip Carey] was a widower who lost his fortune in the war and lived only for his daughter and the Rangers. Little of the press release backstories survived the debut of the series. Laredo started its first season on Thursday evening at 8:30 EST. Its competition was Bewitched and My Three Sons. In its second season Laredo moved to Friday night at 10:00 EST (known as the TV dead zone) and did not survive for a third year. 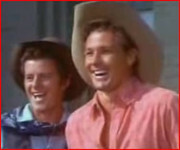 In 1968, a year after its cancellation, several episodes from the first season were edited together to make the feature film, Three Guns for Texas. A year later the pilot from The Virginian also had a brief theatrical run under the title Backtrack. Neville Brand (1920-1992) came to acting as a war hero. He enlisted at 16 and was one of the most decorated GIs in WWII. He acted in training films in the army and used the GI Bill to study drama. With his distinctive voice and facial features, he was a perfect villain. He played Al Capone in two movies and in the TV series The Untouchables. He won top reviews in Riot in Cell Block 11 and Birdman of Alcatraz. Unfortunately, as he admitted, Brand did not have the discipline for a weekly series. His drinking made him hard to deal with and he often did not know his lines, requiring endless retakes. Peter Brown said that "when Brand was sober, doing a scene with him was as natural as having conversation because Brand was so good." Peter Brown (1935) was born Pierre Lind de Lappe to a stage and radio actress. He served in the army in Alaska where he became involved in writing, directing and acting in plays to entertain the troops. Upon his release, Brown studied acting at UCLA and soon began appearing in NBC Matinee Theatre. Brown was signed to a contract at Warner Brothers and appeared in the TV Western The Lawman as Deputy Johnnie McKay. He also appeared in the other Warner Brothers TV westerns and in several successful movies, including Darby’s Rangers, and Merrill’s Marauders. Later Brown went on to star in roles on TV soap operas. William Smith (1934) began acting at age eight and has appeared in almost 300 feature films and television productions. He is perhaps best known for playing Anthony Falconetti on the TV mini-series Rich Man, Poor Man in 1976. Going against his rough-hewn image, Smith is highly educated and speaks several languages. He abandoned his Ph.D. studies for a contract with MGM. Smith is an amateur boxer, played semi-pro football in Germany and competed in motocross and downhill skiing events. He entered films as a stunt double for Lex Barker. In addition to Laredo, Smith had roles in Gunsmoke, Hawaii Five-O, I Dream of Jeannie, and many, many movies. Phillip Carey (1925-2009), a former Marine, appeared in such films as This Woman is Dangerous with Joan Crawford and Calamity Jane with Doris Day. His career began with ten characters in ten episodes of the Ford Theatre, a popular 1950s television drama series. He also guest starred on 77 Sunset Strip and played the lead in Philip Marlow. After his stint on Laredo, Carey moved over to the soap operas, starring in All My Children, and One Life to Live. Robert Wolders (1936) is a Dutch television actor. After Laredo he had various guest roles in other shows but has not acted since the 1970s. He is most famous for his marriage to famed actress Merle Oberon in 1975. After she died in 1979, Wolders became the companion of Audrey Hepburn until her death in 1993. 1.Chad Cooper’s horse in the series, Amigo, was Peter Brown’s personal horse. 2.Brown supported himself by working at a gas station when first starting out as an actor One evening Jack Warner stopped in for a fill-up and they started talking. The next day Brown was offered a screen test at Warner Brothers. 3. In the first Laredo season Chad Cooper sported a cross-draw, wearing his revolver backwards on his left hip. Brown thought it would be an interesting difference from the standard draw he used in Lawman. Although known as one of the best gun handlers in TV westerns, Brown never mastered the cross draw. So we never see Chad draw his gun during Laredo’s first year, although he did a very fancy spin in returning it to the holster. The second year he returned to the standard draw.